It’s time for another SUO challenge and this time our theme is Sweet Treats. As soon as I saw this challenge I thought of the Mini Treat Bag from the Occasions Mini – it’s such a great size…not too big but not too small and with all the ‘extras’ in there, you really have it made! All the ‘cut out’ pieces came with the mini treat bag thinlits…how could you NOT have this? Seriously…it’s in there! And I decided to use one of my favorite color combos of Night, Coral, White! Cut out the ‘bag’ portion using Whisper White. Run the pieces through the Lucky Stars Embossing folder then put the bag together. Using the star that comes in the set, cut out one each of Night of Navy, Calypso Coral, Silver Glimmer. Add the Navy and Coral ones to the bag. Cut out the Whisper White banner (again…one of the pieces in the set) and the enjoy (still another piece) from Night of Navy. Add the enjoy to the white banner. Take a 1″ strip of the Calypso Coral print in the Birthday Bash dsp. Use the same framelit as the White Banner and cut the dsp. Cut piece in half, layer behind the white banner then add using dimensionals. Tie White Bakers Twine into a Calypso Coral large button and add to bag to finish off. 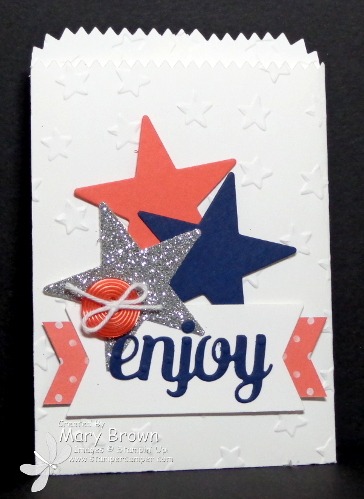 This entry was posted in 3D, SUO Challenge and tagged Mini Treat Bag. Bookmark the permalink.